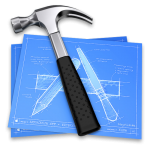 Create the model in XCode (it is essential do this first, because XCode uses a specific naming convention and adds several underlying tables to the actual data model. Import the database in your application and you should be good to go. Coming back to the ultimate purpose of this blog… helping my memory! If you need more info about different date formats see Unicode Date Format Patterns. Of course if you usually work with standard dates you can use setDateStyle instead of setDateFormat. He is a quick way to separate iPhone 4 / iPhone 3 code snippets. After recently developing a few iPhone apps, I found it to be a redundant task to create 6 icons every time I make a new app. To make this process faster, I’ve created a PHP script that takes the highest resolution icon and converts it down to the 6 icons required. It only takes a few seconds to create all of the icons and when the script has finished running you will be able to download them all in a nicely zipped up file. I’ve also got instructions there that will show you what to do with the icons once you’ve downloaded them. First make sure you have ssh and bsd subsystem installed from installer. If you cant find the source reboot or turn off wifi and back on. Next get WinSCP and find your iPhone’s ip by going to (on your iphone) settings > Wi-Fi > “Your selected WiFi” > Look under IP Address- Connect to your iPhone using WinSCP (user: root password: alpine) Change File Protocol to SCP. NSFileManager offers a convenient way to write images to and load them from the documents directory. // gl renders “upside down” so swap top to bottom into new array. // there’s gotta be a better way, but this works. I did have this weird issue also when updating to SDK4.0. I couldn’t get CLLocationManager to work on simulator. This problem also existed in iPhone Simulator 3.1.3. The solution is quite weird. Open the Airport (wifi) in your mac and the CLLocationManager will work as before fetching the Cupertino, or in my case fetching a wide area of my country. I guess the Location is estimated by the internet ip address of your connection.